Socio-Political-Journal... : Are these NYC STATUES Next on the Chopping Block? ...theodore M I R A L D I. When it comes to art, hate is in the eye of the beholder – and some historians worry that Mayor de Blasio’s plan to root it out of the city’s monuments could spiral out of control. The city is searching for “symbols of hate on city property,” de Blasio announced Wednesday, and will eliminate any offending marker or sculpture. It was a reaction to violent protests against the removal of a Robert E. Lee statue in Charlottesville, Va. But history is not so simple, Bogart told The Post. “This drumbeat of iconoclastic sentiment is just feeding on itself, leading to this frenzy that we might really regret,” Bogart warned. 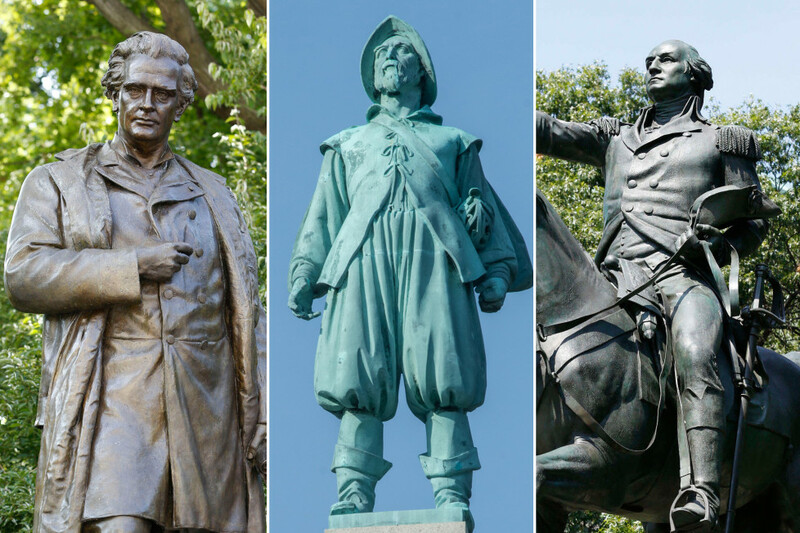 As activists name and shame historical figures who don’t measure up to current standards, The Post toured some of the city statues that could end up on the mayor’s chopping block. This statue of the great environmentalist Roosevelt, sitting astride a horse and flanked by African and Native American figures, was meant to symbolize a progressive president uniting America’s races. Some activists today see it as an image of white supremacy, with Roosevelt towering over his companions. A fervent opponent of slavery, Beecher inspired thousands to fight for the Union in the Civil War. But his monument depicts an African-American woman kneeling at his feet to lay palm fronds before him – which some regard as a message of white supremacy. The signer of the Declaration of Independence, ambassador to France, scientist, and inventor of bifocal glasses and the lightning rod was the most famous man of the American Colonies. He was also a slave owner for most of his life and brokered slave sales through his printing business. Long revered as the heroic sailor who discovered America in 1492, some activists today revile Columbus as an imperialist colonizer who slaughtered and enslaved indigenous Caribbeans. City parks host five major monuments to him. The “Father of Our Country” is honored by at least five public statues in NYC, as well as the triumphal Washington Square Arch; but this one is the city’s longest-standing outdoor sculpture. However, the general owned slaves from the age of 11, and more than 300 slaves labored at his Mount Vernon plantation at the time of his death. One of New York’s best-loved mayors, serving from 1934 to 1945, the “Little Flower” fought the city’s corrupt patronage system and built vital infrastructure. He also persecuted Japanese Americans during World War II – forcing their businesses to close, putting thousands under house arrest, and detaining hundreds more without trial. His firm administration brought order to the rowdy Dutch colony and set the stage for New York’s future success. He also hounded religious minorities, imprisoning and banishing Jews, Quakers, Lutherans, and others. Mail carriers nationwide sent contributions to erect this monument to Cox, who fought to improve their pay and benefits. He served 15 terms in Congress, representing districts in both Ohio and New York. He was also an anti-abolitionist who, in 1864, pushed racist “fake news” that nearly derailed Abraham Lincoln’s re-election campaign. One of the great orators of the 19th century, Webster served as a senator and congressman from Massachusetts and U.S. Secretary of State. Despite his personal opposition to slavery, he advocated the Fugitive Slave Law, which required northerners to return runaway slaves to their owners. The law was among several passed by Congress in 1850 that temporarily staved off the Civil War. Hudson claimed the area that is now New York for the Dutch in 1609, setting the city’s history in motion. Today, some activists condemn him as an imperialist interloper who looted Native American villages, kidnapping and killing local people. This statue depicts an anonymous Pilgrim, one of those who established the Plymouth colony in 1620. The Pilgrim story of hardship and faith – and, of course, Thanksgiving – is central to American culture. Yet they and the New England settlers who followed them massacred thousands of Native Americans in the decades after their arrival. This flagpole commemorates one of New York’s earliest myths, the Dutch purchase of Manhattan Island from the Canarsee. Indigenous advocates condemn European colonization as imperialism that destroyed native cultures. Author Rudyard Kipling chronicled the British empire of the 19th century in stories and poems like “Gunga Din.” Recent critics see The Jungle Book, a collection of allegorical children’s tales, as offensively pro-segregationist. Duarte advocated independence for the eastern half of the Caribbean island of Hispaniola, which was under Haitian rule in the early 19th century. In 2007, activists in New York publicized claims that Duarte’s goal of Dominican separatism had racist roots.